Nica RusticaThere are 2 products. 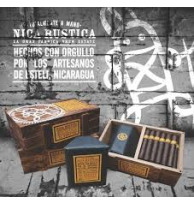 Nica Rustica was created to be a tribute to Esteli Nicaragua, both its’ people and the amazing leaf that grows there. Jonathan Drew of Drew Estate has used the phrase “Con Orgullo (with pride)” to describe the people and culture of Esteli. “El Brujito” means “Witch Doctor” or to the locals “the Shaman”. They take pride in the symbol and images of it can be seen throughout the city. It is only fitting that El Brujito (6 x 52) is also the name of the single size of this new flavorful line of cigars. The use of tobacco by “The Shaman” in ceremonial and medicinal rituals goes back thousands of years and the symbol of “El Brujito” was carved in stone over 6,000 years ago and discovered in Esteli—now it can be seen on each box of Drew Estate’s Nica Rustica. The cigar is rustic looking as its name implies, with a short curly pig tail and covered foot. It’s definitely not a pretty cigar, nor is it supposed to be. The Connecticut broadleaf wrapper is a rusty brown color with medium size veins and slightly rough texture. Don’t let its appearance fool you, because under that unassuming wrapper is a perfect every day, anytime cigar. What it lacks in appearance, it more than makes up for in quality and flavor. It’s medium to full-bodied, flawlessly constructed for a perfect burn and an easy draw, produces volumes of thick, rich flavorful smoke and has a nice long finish. The burn time on this cigar is slow and produces a solid white ash.